for $4,200,000 with 6 bedrooms and 7 full baths, 1 half bath. This 9,200 square foot home was built in 1991 on a lot size of 1.9900 Acre(s). 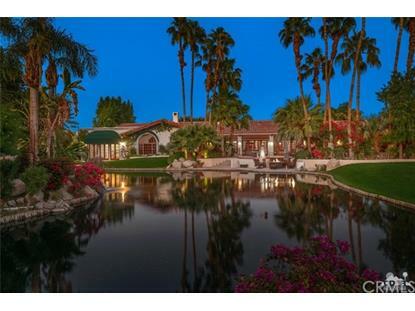 Amazing estate on nearly two acres at La Quinta Polo Estates! Six bedrooms, seven and a half baths, including guest house. Approx. 9, 200 sq. ft. on 1.99 acres. Featuring gated entry to towering portico and elegant formal entry hall. Great room with fireplace, beautiful floor to ceiling art displays, custom wet bar and game area. Gourmet kitchen with gorgeous center island, morning room, family room with fireplace, formal dining and library. Large master suite with fireplace, den with fireplace and gym with fireplace. One bedroom guest house with living room with fireplace and full kitchen. Wonderful outdoor entertainment area with fireplace, media and dining. Unique BBQ table, fire pit, custom pool with waterfall and spa. Park like grounds with private lake, tennis court, fruit trees and fountains. Offered furnished per inventory!